The Rice Mill venture was established by HWC in 2012 as part of the strategy to improve food security in the face of climate change and the increasing population. HWC entered an agreement in 2013 to start running the rice mill, donated from New Zealand, in what is now Luman Hipakoko. The Environmental Education & Advocacy team works to protect Hako’s environment, heritage and culture and to promote the proper management of natural resources as mothers of the land in a matrilineal society, in partnership with Pacific Black Box. ​The team works on issues connected with environment and biodiversity, climate change and land use. The detailed program can be viewed here. develop and conduct environmental awareness programs, digital and media activities for each age group, for Hako schools. Some of the outlying islands and atolls of Bougainville are less than two metres above sea level. Click here to read an article about relocation from the Cartaret Islands, or here for an article in Tok Pisin. See also the videos on this subject made by community members with Pacific Black Box. 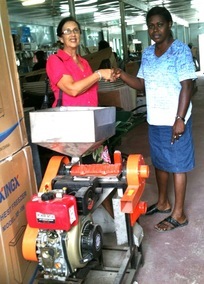 Marilyn Havinireceiving the rice mill on behalf of HWC.